Max. Pressure for connections P-A-B: 315 bar. Max. Pressure for connection T: 210 bar. A Subplate is required to run it. 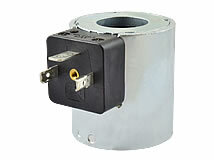 The 230V Version has a 205V co-current flow magnet with plug and integrated flow straightener. 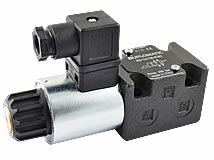 It is compatible with industrial valves Nominal Size 6. 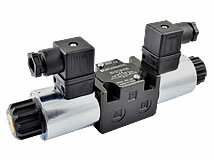 The 205V DC coil gets used with an upstream reticifier for the application with 230V AC.